The ghosts of Christmases past, present and future come bearing lessons of academic publishing. In keeping with the festive season, I’m going to frame some thoughts on stages of academic publishing with a Dickensian motif. I’m trying to develop an approach that covers three phases of a journal article’s life, so let’s go for a Christmas Carol. 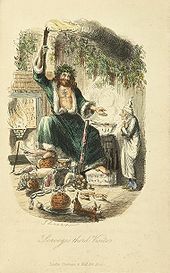 The Ghost of Articles Past – Scrooge is shown his own past Christmases, and given to reflect and reinterpret them. 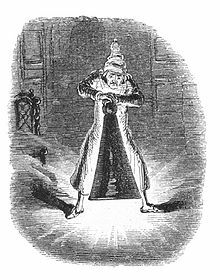 The Ghost says he is there for Scrooge’s ‘reclamation’. For articles, they are usually published in a journal, where they may receive an initial flurry of interest, and unless they become a standard text they fall into obscurity (indeed most never emerge from obscurity). As I mentioned in my last post, I’m interested in the possibilities that open access allows for a new life for articles, for them to be taken, republished in different collections or reused in different contexts. This can happen with existing, proprietary articles but it’s a closed process, it is open access that allows for the generative, innovative reuse that will allow articles to be reclaimed. This idea is somewhat in its infancy in terms of meta-journals and having a critical mass of open access content, but in other ways one of the oldest practices online with bookmarking, linking and blogging. 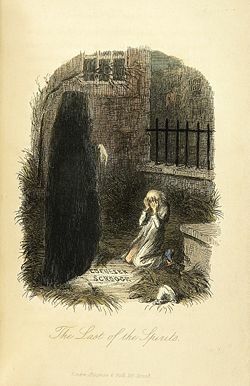 So it indeed resembles the first of Dickens’ spirits in being “like a child: yet not so like a child as like an old man, viewed through some supernatural medium”. The Ghost of Articles Present – This is the easiest one, as it represents the norm. I’ve written about academic publishing a lot, especially in this chapter of my book, so I won’t repeat it all here. But despite the many criticisms we may have of it, the carefully researched, well-written and peer-reviewed article has a strong place in academia and is in many ways the core practice that allows it to distance itself from commercial or marketing influence. But it’s also a bloated industry in its own right and one that is both bountiful and undergoing change, just as Scrooge is in the midst of change as he views the different interpretations of present Christmas. So we can both see the current publishing model as akin to the Ghost who was “a jolly Giant, glorious to see” and also one who like the Ghost of Christmas Present is destined to fade soon. ArXiv has become the de facto distribution medium for scholarly articles in Physics, with Sir Martin Rees commenting that it has “transformed the literature of physics, establishing a new model for communication over the whole of science. Far fewer people today read traditional journals. These have so far survived as guarantors of quality. But even this role may soon be trumped by a more informal system of quality control, signalled by the approbation of discerning readers”. My plan is to try and cover all three of these aspects. I have the Meta EdTech Journal, am an editor on JIME, and am trying to set up an arXiv type pre-print for ed tech. I think people often see new technological approaches supplanting old ones, but it’s the complementary nature I find interesting. It is the advent of alternatives to previously monolithic systems that is exciting. This blog was originally posted on Martin Weller’s own blog, the Ed Techie.